Today is an important day in internet history. I’m going to share with you my family Nutroll recipe. This is a recipe that has been handed down generation after generation. After some discussion, my family decided I could blog about it. I don’t want to lose your attention, so I’m going to divide this into a few posts. The entire recipe will be shared at the end of the final post - so make sure you read every day. I describe nutroll as sweet bread that tastes like heaven. It also includes some nuts. Every year between Thanksgiving and Christmas day together my family makes around 18-36 nutroll loaves. My includes my Grandma (boss lady), Grandpa (Leroy Coltrain), Dad (Shady), his wife (Knitmaster), My Aunt (Lola), her hubby (Money Matt), my cousins (B-Dogg and Banana), myself, GB (although he missed it this year), sister (Sly) and her husband (MEW). There are 3 parts to preparing nutroll to bake. You have to make the dough, prepare the filling, and roll the nutroll. Today, I’m focusing on the dough. Before you attempt to make nutroll for your self - make sure you have the complete recipe and read the entire thing. Many a nutroll has been ruined by not reading the recipe. Make sure you keep reading Kiss My Smash everyday to get the full recipe and guidelines. Although a distant relative believes we break the rules - we like to use a stand mixer for the dough and grinding the nuts. I’d recommend it. The first instruction within my family’s recipe: Grandma is always the boss. If you don’t follow this rule, you are destined to fail. 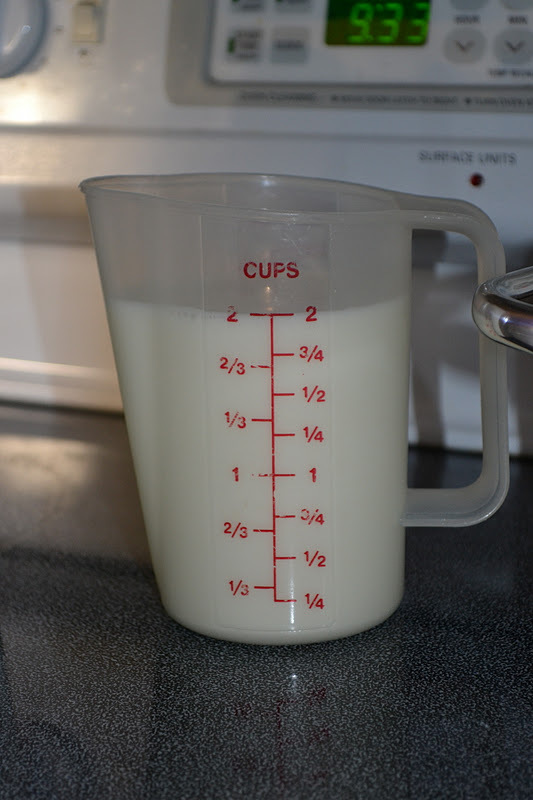 First you will combine the cups of Milk with the 3 sticks of butter in a saucepan. Heat over medium heat until very warm. We use a candy thermometer to gauge. It’s ready when it’s anywhere between 120-130 degrees. The butter will not melt completely. Next warm the mixing bowl with warm water and dry completely. Place 3 cups flour, 1 cup sugar, 1 1/2 teaspoon salt and 8 tsp in mixer. Boss Lady's dog Tess was a big helper that day. Don’t forget to come back tomorrow to find out what happens next. Update: Here's Part 2 and Part 3. In the first part of the directions (when you add 3 cups of flour, sugar salt...) and "8 tsp". My question is 8 tsp. of what? Thanks! My guess would be YEAST. There is 2 1/2 tsp of yeast in 1 packet. I made this nut roll recipe for the first time ever last Easter for my 86 year old Polish dad. We haven't had it since my grandmother died in 1983. She always made it for the whole family and the recipe went with her. My dad said the nut roll out of your recipe was the best nut roll he has ever had, so naturally I will be proudly making it for this Easter. Thank you for sharing it.